So, as you imagine, there are a lot of muscles in this region. Let´s focus on the muscles of the hip. · Tensor fasciae latae muscle: Assist in keeping the balance of the pelvis while standing, walking or running. Medial rotation and flexion of the hip. Assist weakly with the extension of the knee, lateral rotation of the leg at the knee. Also stabilizes the hip and the knee during standing. ITBS is the most common pain syndromes in runners, weight lifters, dancers, tennis players and basketball players. Pain or a stinging burning sensation is felt on the outside of the thigh down to the lower knee. Pain is more pronounced when the foot hits the ground while walking or running. Pain from trigger points in the tensor fasciae latae muscle is often diagnosed as bursitis of the hip or thinning of the hip cartilage. · Gluteus maximus: When the gluteus maximus takes its fixed point from the pelvis, it extends the acetabula femoral joint and brings the bent thigh into a line with the body. Taking its fixed point from below, it acts upon the pelvis, supporting it and the trunk upon the head of the femur; this is especially obvious in standing on one leg. · Gluteus medius: with the leg in neutral position, it works with the gluteus minimus to pull the thigh away from the midline (abduct the thigh). During gait, supports the body on one leg, in conjunction with the tensor fasciae latae muscle to prevent the pelvis from dropping to the opposite side. With the hip flexed, it works with the gluteus minimus to rotate the hip. With the hip extended, both externally rotate the thigh. – Always carrying heavy objects on one side such as filled buckets, heavy briefcase, etc. · Gluteus minimus: with the leg in neutral position, it works with the gluteus medius to pull the thigh away from the midline (abduct the thigh). During gait, supports the body on one leg, in conjunction with the tensor fasciae latae muscle to prevent the pelvis from dropping to the opposite side. With the hip flexed, it works with the gluteus medius to rotate the hip. With the hip extended, both externally rotate the thigh. · Piriformis: laterally rotates the femur with hip extension and abducts the femur with hip flexion. When the hip is flexed to 90 degrees, piriformis abducts the femur at the hip and reverses primary function, internally rotating the hip when the hip is flexed at 90 degrees or more. – The sciatic nerve runs under the piriformis. The piriformis muscle will sometimes agitate the nerve causing symptoms of sciatica which include pain, tingling, and numbness in the buttock, hip, back of the thigh, back of the calf which extends to the bottom of the foot. This is known as piriformis syndrome. In approximately 15% of the population, the sciatic nerve runs directly through the piriformis muscle. These people are more like to have symptoms of sciatica. – Women are more prone to problems with piriformis muscle pain. · External obturator muscle: acts as the lateral rotator of the hip joint. As a short muscle around the hip joint, it stabilizes the hip joint as a postural muscle. · Internal obturator muscle: helps laterally rotate femur with hip extension and abduct femur with hip flexion, as well as to steady the femoral head in the acetabulum. · Quadratus femoris: it is a strong external rotator and adductor of the thigh, but also acts to stabilize the femoral head in the Acetabulum. · Psoas major: contributes to flexion in the hip joint. On the lumbar spine, unilateral contraction bends the trunk laterally while bilateral contraction raises the trunk from its supine position. 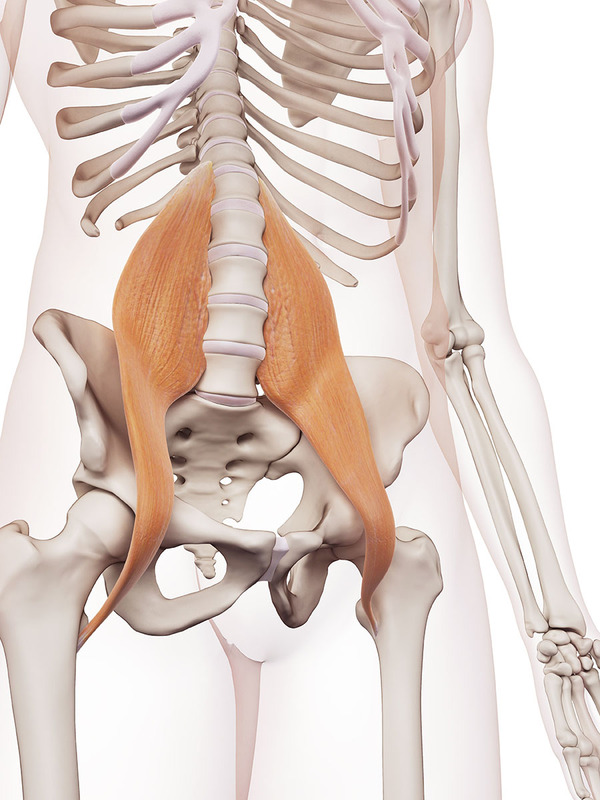 · Psoas minor: is a weak flexor of the lumbar vertebral column. · Iliacus: is important for lifting (flexing) the femur forward. From its origin in the lesser pelvis, the iliacus acts exclusively on the hip joint. – Extreme dysfunction in the iliopsoas can cause pain under the shoulder blade that extends down to the top of the hip. I love travelling and cooking. Your blogs are delicious and I´m looking forward to reading the next post. Of course, I´m glad to hear about your healthy habits and if I can help, you know where to find me :) Have a nice day! !